Posted 15 October 2013 & filed under Agriculture. Sopwell cottages belonged to the farm at New Barnes which is now part of Sopwell House. 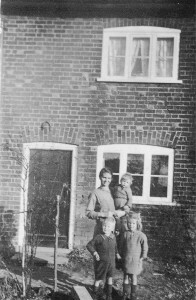 Beryl Whitney (nee Parrott) writes: “In 1927, my parents were able to take up the tenancy of one of the Sopwell Cottages as my father was a dairyman at the farm. I and my three siblings were born at the cottage and my eldest sister and I attended St Peters school. It was a long walk to school, across the field, over the railway line into Cottonmill Lane. In 1937 we all moved to London Colney. 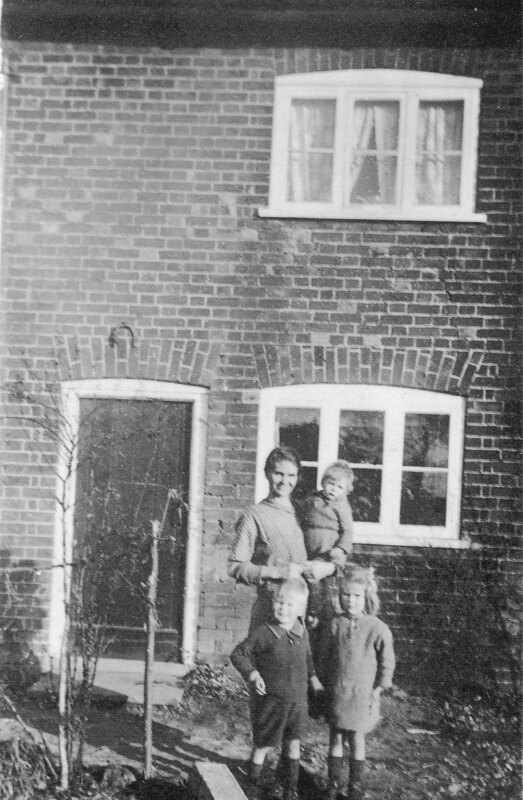 This is a picture of my Mum, Annie Parrott, and three of her children outside Sopwell Cottage, taken sometime late 1920/1930. I was only seven when we moved from the cottage and can’t remember a lot, but I know we didn’t have a bathroom or toilet, and only had oil lamps and candles and all cooking was done on the fire-range. A water pump was in the front garden”.